PITTSBURGH—September 27, 2018—At a time when metrics and KPIs rule all decision making in the media buying process for advertisements, a new report examining churn across broadcast, digital broadcast and radio found that broadcast is least likely to experience churned accounts at a 36.34 percent churn rate; followed by radio with a churn rate of 43.76 percent; with digital broadcast proving the most volatile with a churn rate of 50.09 percent. 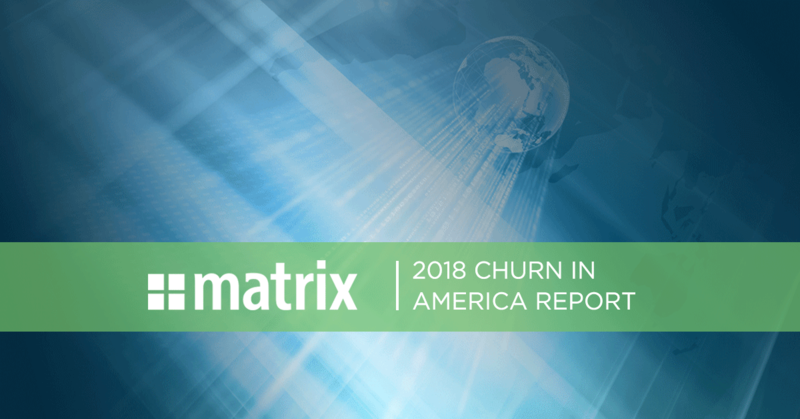 For more churn information on brands, additional information detailing specific churn information across platform and industries and a national versus local analysis on churn, please see the full 2018 Ad Spend Churn in America Report here. Matrix Solutions looked at more than $9 billion worth of relevant media ad sales deals, excluding political ad spend, to determine the churn activity across platforms, industries and brands in the United States – normalizing each category from the activity of more than 400,000 active accounts within media ad sales teams selling broadcast, digital broadcast and radio inventory. Data was derived from Matrix’s global ad sales platform Monarch. Data was captured from July 2016 to June 2018. For more information, please visit matrixformedia.com.